Here’s the family classic, Monopoly! I have this on my N8 and now on my Lumia 800. I’m certian there’s some differences but I’ve reached my download limit and Ovi Store will not let me redownload Monopoly without buying it again. If you know how to play Monopoly (the board game) then you’re off to a good start. The game looks great, very colourful and looks great. You get an over all flat view of the board and then 3D view as you move across it. The dice is pretty cool as you physically shake the phone to shake the dice. You can play against 3 others, either people or CPU and you can even change the game rules slightly depending on how you normally play Monopoly. I got a little addicted to this game as I swear the CPU was cheating, always landing me in jail or me on its properties whilst it keeps getting ‘advance to go, 200 bonuses etc’. I made sure I bankrupted the computer, but it takes time. This game may take about half an hour to complete against CPU and much longer if you’re playing with people (unless they cheat and trade properties unfairly :p). Just looking at some recent reviews, seems I’m not the only one, darn cheating computer. It’s also rather sly, it will sometimes ask to trade some cheap brown property for Mayfair. Best game played on windows mobile by far. I don’t know if its just me, but the god dam computer cheats alot lol.. The game runs really well, not had any problems. You can save games to continue later, whilst still have other games playing. I wish real life monopoly had ‘save’ function. I think I’ve only ever completed 5% of all real monopoly games I’ve ever played as they take FOREVER to complete. I bought this whilst it was on the deal of the day ‘sale’ thing that they do every day and again for £2.29 or something lower than the current £3.99. It’s a fun game, a little pricey. Being an Xbox live gave as usual, you earn achievement scores. THE ORIGINAL BOARD GAME WHERE YOU CAN OWN ALL – DESIGNED JUST FOR WINDOWS PHONE 7! Enabled for Xbox LIVE®, collect achievements and “monopolize” leaderboards as you enjoy classic play in the tradition of the beloved, best-selling board game. It’s “GO” time in a whole new way! XBOX LIVE ENABLED! FUN YOU CAN BANK ON! Use your existing Xbox LIVE Gamertag or create a new one via the Windows Phone 7 main menu to track achievements and access leaderboards for this MONOPOLY game. • TRACK UP TO 12 ACHIEVEMENTS – Buy your first property, bankrupt your opponent, own a whole side of the board, and more! Earn achievements and get up to 200 Gamerscore points! • ACCESS UP TO 5 WEEKLY, MONTHLY, AND LIFETIME LEADERBOARDS – See how you stack up against your friends! Who has the most total wins? Spent the most on upgrades? Or earned the most MONOPOLY money? • SEE YOUR AVATAR – Your Xbox LIVE avatar is highlighted when it’s your turn in the game, and you can even see the current “player to beat” so you know the tycoon you need to take down! 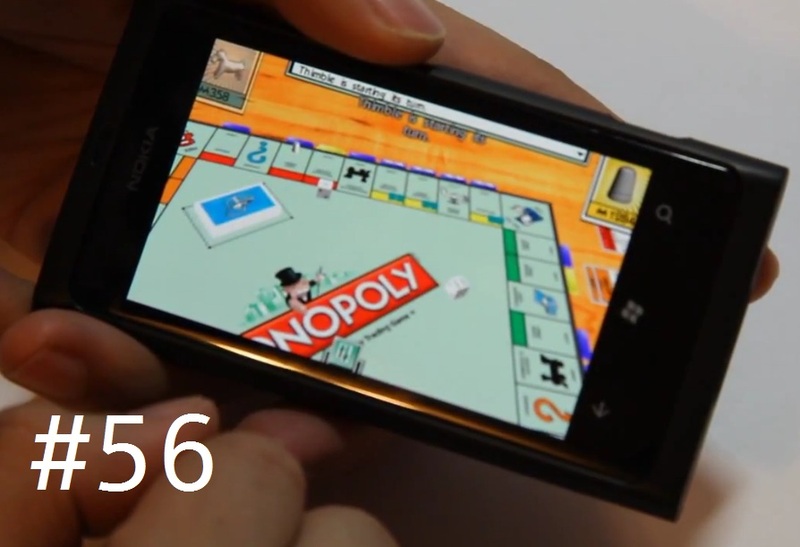 Utilizing the 800×480 resolution of Windows Phone 7, the MONOPOLY board looks sharp! Use the multi-touch interface to zoom in, swipe, and spin from Baltic Avenue to Boardwalk! Play through 3 levels of difficulty and save games in progress. Also customize the number of players, “house rules,” and even the game environment.